How to record money paid into the business, and taken out of the business, by one of the account users, if you have a Universal account with FreeAgent. If you have a Universal account with FreeAgent, here's how to record money taken out of the business, or put into the business, by one of the account users. That person might be a business owner, partner, director, shareholder, employee or accountant. Because the Universal account is intended for worldwide use, all of these user types are available on the Universal account, and all of them have the same options available for paying money into, and taking money out of, the business. To record this, when you are explaining or entering the transaction, choose type Money Received from User. Choose the user's name from the drop-down menu. The only reason you can choose here is Capital Introduced. Save the explanation or the entry. 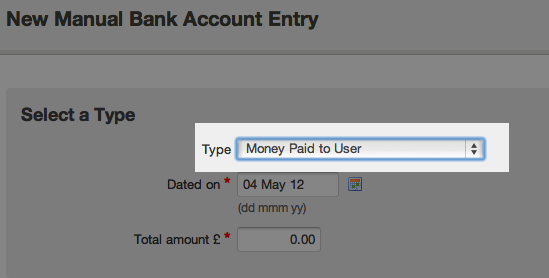 To record this, when you are explaining or entering the transaction, choose type Money Paid to User. Then choose the reason: Drawings, Net Salary and Bonuses, or Expense Payment. Net Salary and Bonuses is for the amount of wages, net of any taxes, payable to that person. Expense Payment is to pay back expenses recorded on the Expenses page of FreeAgent. Any other withdrawals by a user would be Drawings.